The U.S. 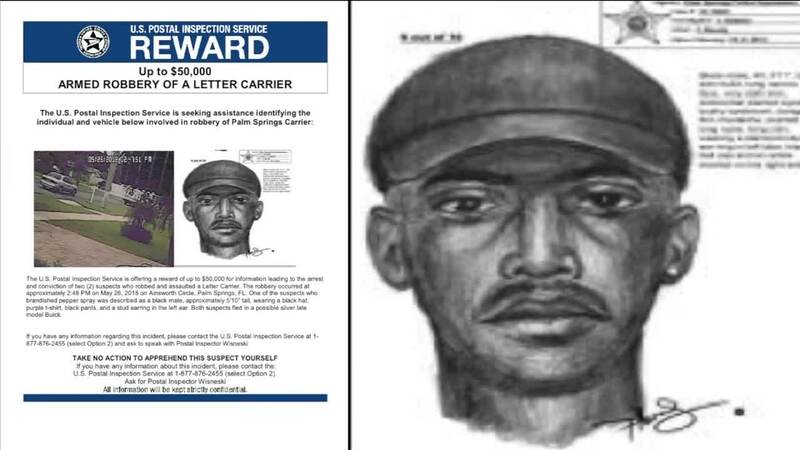 Postal Inspection Service said in a Tuesday news release they are offering a reward of up to $50,000 for information leading to the arrest and conviction of two people who robbed and assaulted a letter carrier in Palm Beach County last month. 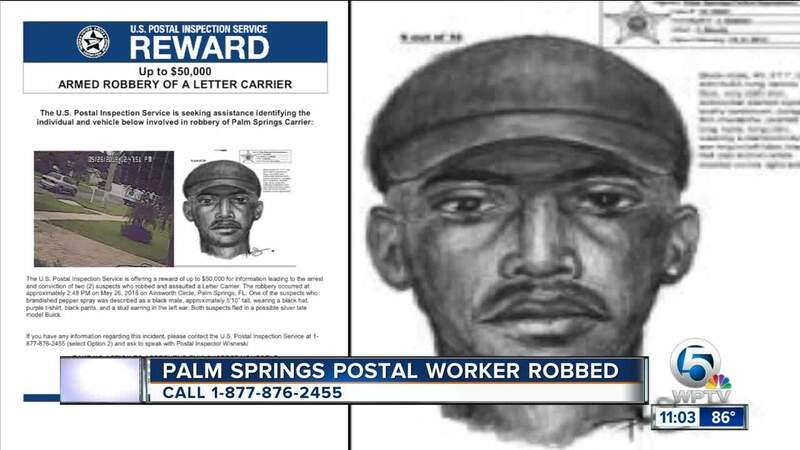 The robbery occurred on May 26 at about 2:48 p.m. on Ainsworth Circle in Palm Springs. The robbers made off with only the victim's keys. The Inspection Service, who is leading the investigation, said the female mail carrier is doing fine. “Thankfully. And that’s our number one priority is to make sure our mail carriers are doing safe," said Blanca Alvarez, a postal inspector. Neighbors wouldn’t speak with us on camera but said they heard her screams during the attack. “Unfortunately anybody can be a victim of a crime such as a robbery. Our carriers are aware that they should look around their surroundings and try to be as safe as possible," said Alvarez. A surveillance camera on a nearby home captured the assault. The U.S. Postal Inspection Service provided an image from that video, showing the suspect car as an older model, silver 4-door Buick. 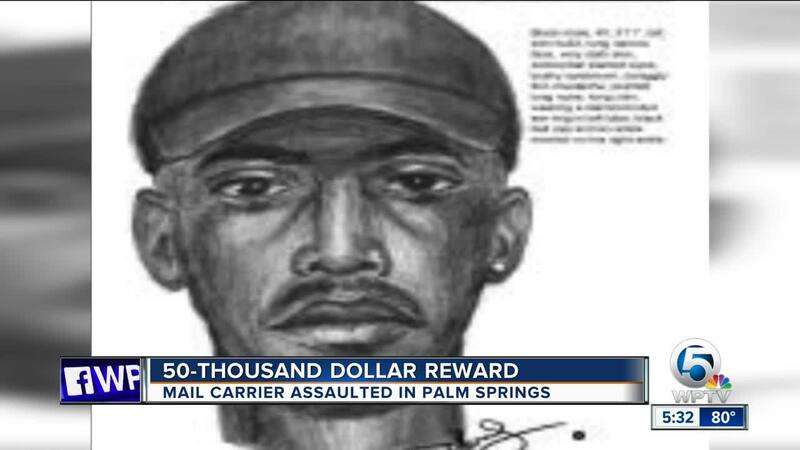 One of the robbers used pepper spray in the attack and was described as a black man about 5 feet 10 inches, wearing a black hat, purple t-shirt, black pants and a stud earring in the left ear. A police sketch was released of the man's possible appearance. “We released it to see if maybe the residents can look at the sketch, look at that vehicle and see if they recognize it," said Alvarez. The Palm Springs Police Department are assisting the U.S. Postal Inspection Service in the investigation, as both agencies hope for some leads. “We hope if they saw something suspicious the day before or that day afterward, to call local police or the postal inspector so we can follow up on it," said Alvarez. The suspects face federal charges of armed robbery and assault of a postal carrier, with punishment up to 25 years in prison. Anyone with information in the case is urged to contact the U.S. Postal Inspection Service at 1-877-876-2455 (select Option 2) and ask to speak with Postal Inspector Wisneski.